Set in the heart of the golfing mecca of Mijas, Hacienda San Jose offers easy accessibility to some the most notable European golfing courses. Designed By Robert Trent Jones SNR the newly refurbished and renowned Mijas Golf is based around Los Lagos and Los Olivios courses. Together they deliver one of the most outstanding and challenging courses with stunning and superior surroundings and services. La Cala golf is equally outstanding with its championship 18 hole presentation and facilities. Designed by Cabell Robinson further inspiration is drawn by the most incredible panoramic mountain and Mediterranean views. Santana Golf is truly inspirational with it’s fine and magnificent 18 hole course designed as well by the renowned Cadell Robinson. Offering well defined fairways on level terrain where water features enhance it’s natural and historic surroundings Santa Golf embraces the essence of golf within Spain. 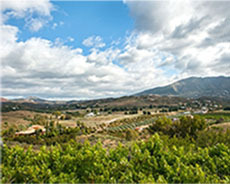 The grounds of Hacienda San Jose are ideal for outdoor weddings with large expanses of grass, tropical flowers, fruit trees and the most breathtaking views that the Costa del Sol, Spain has to offer. Catering is significant factor in the smooth-running of your event. Our In-house caterers have specialised experience in wedding catering and have arranged many successful weddings already at the villa. They provide an all-inclusive package with waiters, equipment, linens, glasses, etc. All in all, a service designed in making things as smoothly organised and calm-running as possible. 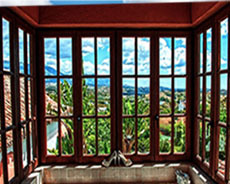 The facilities that Hacienda San Jose has to offer are second to none. Fully equipped for caterers, cleaning and wait staff. The most celebrated chefs will find everything they need at the ready. 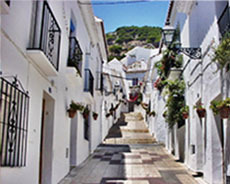 Mijas is only a short drive from Malaga Airport, infamous Marbella and celebrity-haunt Puerto Banus, yet it maintains the authentic Spanish ambiance. The villa blends perfectly in this environment.